The Phonomena II+ is the successor in our affordable phono preamplifier series, celebrating 15-years in the market. The Phonomena II+ features an improved chassis design, based on our more expensive Nova II, and is available in both black and silver finish. Boasting a new circuit board layout, the Phonomena II+ delivers discrete dual-mono signal paths, affording the listener more vibrant and dynamic music reproduction with a blacker background. Expertly made, inside and out, the Phonomena II+ s small footprint optimizes signal path integrity, while its black or silver finish options are sure to match the rest of your components. The Phonomena II+ is proudly Made in the USA and provides phenomenal sound and flexibility at an affordable price. 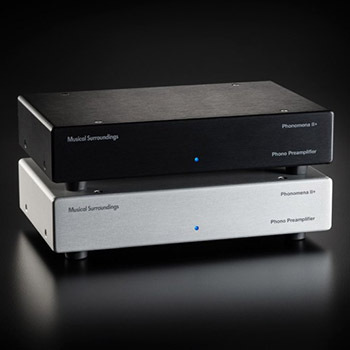 Since its very inception, Michael Yees Phonomena phono preamp has been an unqualified success. The new Phomomena II+ builds on the strengths of its predecessor with a host of new improvements. It offers a wealth of flexibility along with outstanding resolution and an extremely low noise floor. A very nice unit indeed, and highly recommended. The new circuit topology designed for the Nova has proven itself a winner, so why not let some of that magic trickle down to a less expensive offering? Done! The all new Phonomena II+ borrows much from the circuits found in the Nova and Super Nova and exhibits the sound that these outstanding California-born-and-bred-designs are famous for. A peek inside reveals an all discrete circuit, a feature surprising at this price point given most of the competition have resorted to ICs. Another feature copied from the Nova is the impressive array of gain and loading switching, easily accessible via rear panel mounted switches. The Phonomena II+ offers an outstandingly clean and refined sound with good soundstaging and very low background noise.